I've been kayak fishing out of a Old Town Predator PDL Kayak for roughly a year. I considered writing a review a few months ago, but I wanted to make absolutely certain that I put it in every situation imaginable before sharing my opinions. Fast-forward to now and my verdict is in: This is one tough and easy to use kayak. At no point in the past year have I babied my Predator PDL. I have run it aground, I have slid it in and out of my messy truck bed and into remote ponds and rivers littered with jagged rock and vegetation and I have stored it outdoors for the entire time I've owned it. I wanted to know for certain that this kayak could handle whatever a diehard angler threw at it. I'm going to explain what I've learned about this kayak. 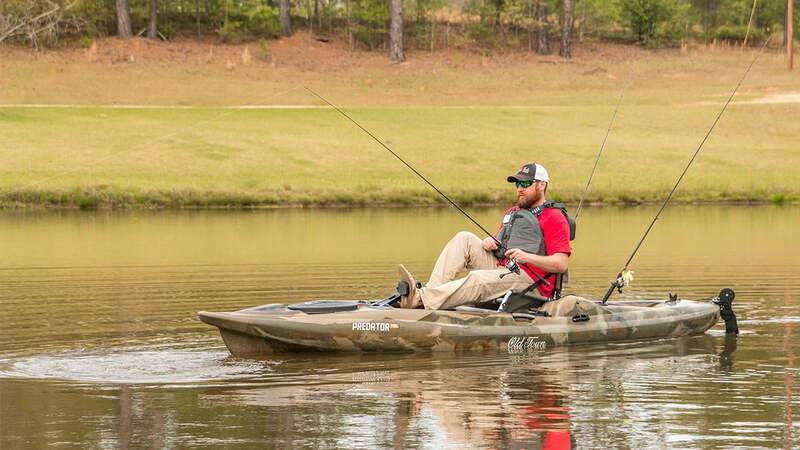 If you're considering getting into kayak fishing or even upgrading your rig, I'll include plenty of information to help you make an informed decision. This has been one of the biggest benefits of owning the Old Town Predator PDL. 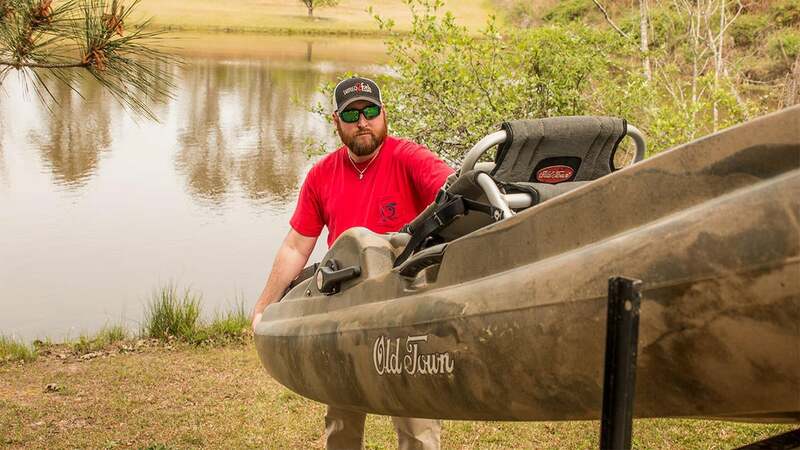 One of the most exciting aspects of fishing for me has always been finding those hidden honey holes nobody else knows about; this kayak has certainly allowed me to do that. I have an aluminum boat I've always used to get into these hard-to-reach fisheries, but I have not used it one time since getting this kayak. I don't have to worry about charging batteries, hooking up a trailer, backing a trailer without a boat ramps, or messing up an expensive hull in a stump-filled oxbow pond. I can quickly slide the Predator PDL in the bed of my truck and I'm ready to fish. 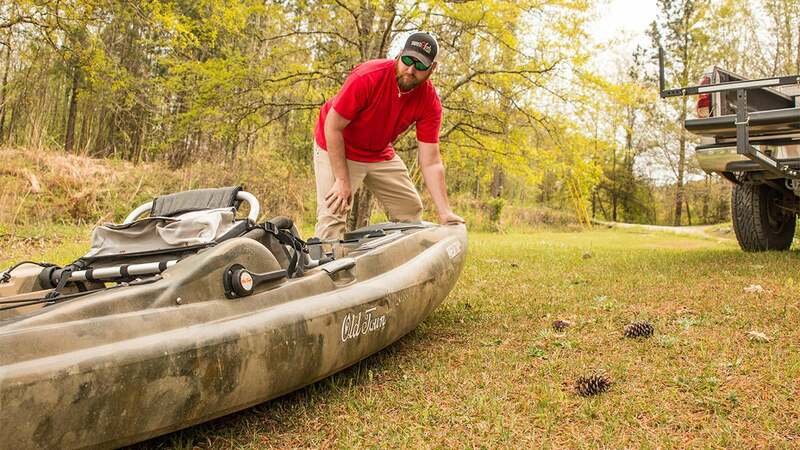 This kayak has definitely seen more dirt roads than paved ones. That's the way I like it. It's important to understand that this is a big kayak. To be totally honest, I underestimated its size and was a little shocked when I first saw it in person. Measuring at 13 feet, 2 inches, you have to take into consideration how you plan on hauling it. You could certainly go the route of getting a trailer for your Predator PDL, but I chose to simplify things and buy a truck bed extender. 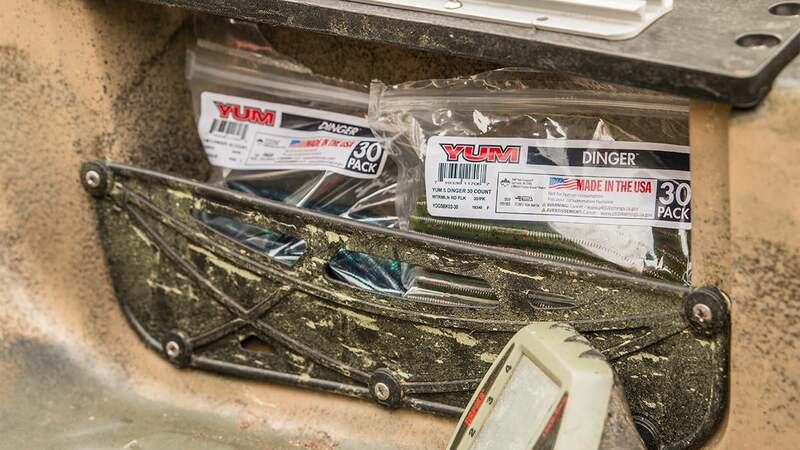 Contractors and plumbers use them a lot for hauling long pieces of lumber and pipe, so you can find them at places like Harbor Freight and even Amazon. I think I paid roughly $50 for mine and it's really sturdy and holds my kayak in place without any issues. My wife and I have been remodeling our house this year and I always have left over gravel, rock, crushed pavers and other yard items in the bed of my truck. 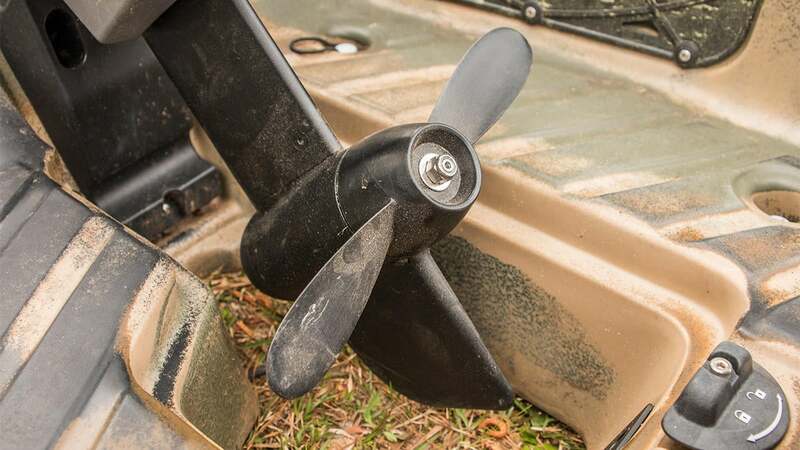 The Predator PDL's performance crafted tri-hull can handle it. I never worry about scratching it while loading or unloading or dragging it down to the water's edge. I really like the fact that it's such a workhorse. 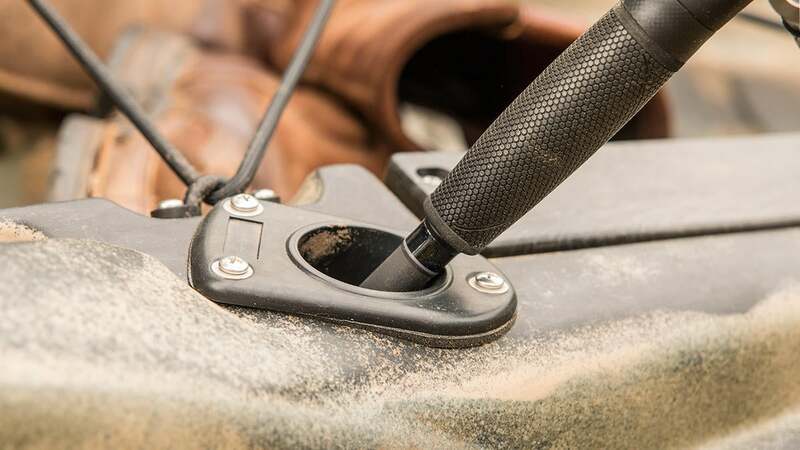 These carrying handles are located on each side of the kayak and make loading and unloading quite simple. 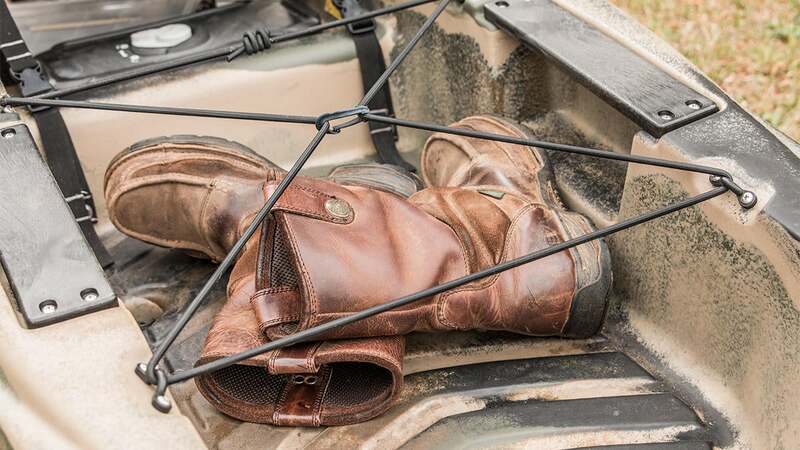 They're also very sturdy and can be used to carry your kayak longer distances in remote situations. I'm at my most impatient when I first pull up to a lake or river. 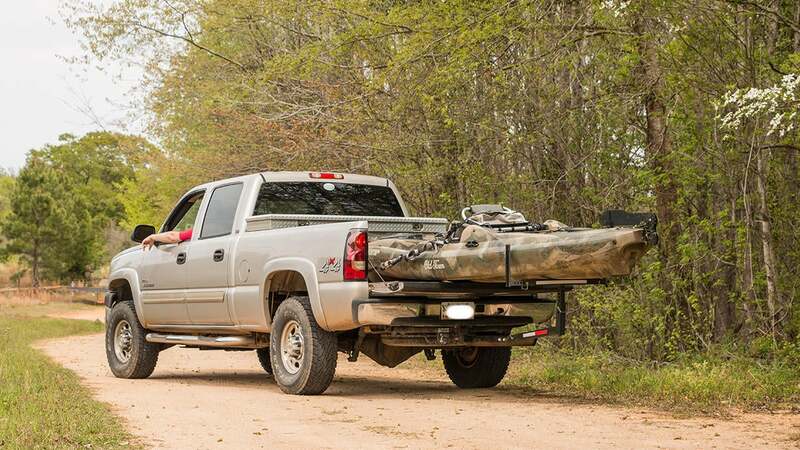 I'm ready to get out of the truck and go fishing. Thankfully, I can unload this kayak in about ten seconds. It weighs 117 pounds so a little help is always welcomed, but if you're in relatively good shape you should be able to unload it by yourself as well. Once the Predator PDL is unloaded from my truck and on the ground, it's easy to push to the shoreline. 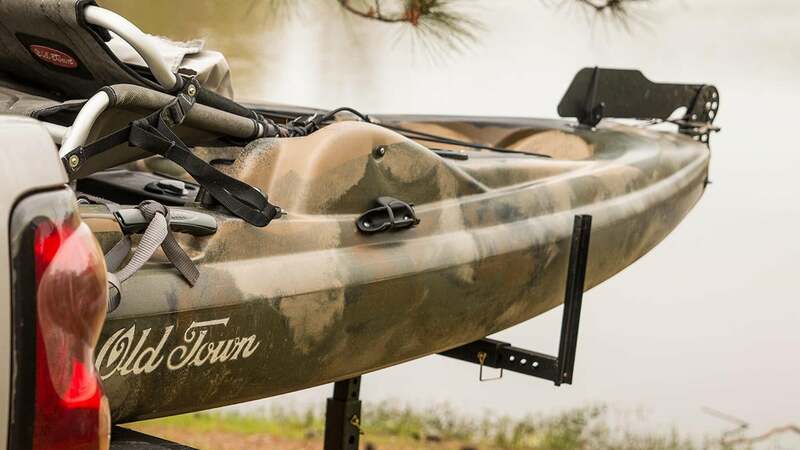 Both the bow and stern have easy-to-grab areas for pushing and pulling your kayak. You can tell by this seat that I've put the Predator PDL through its paces. 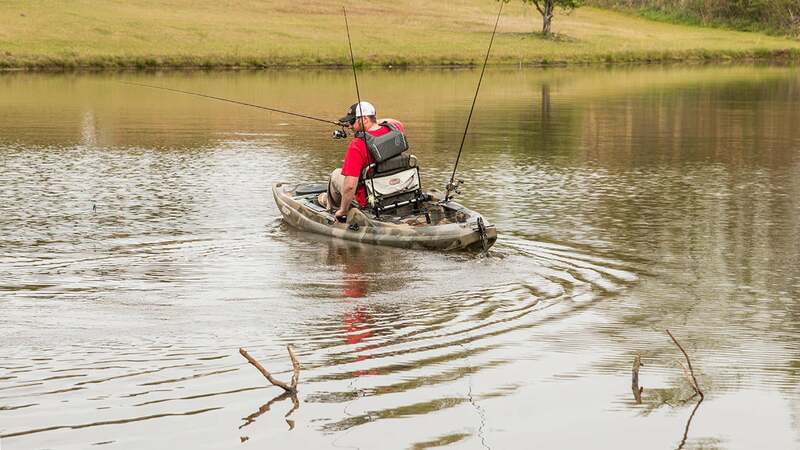 The adjustable options on the seat are still fully functional and provide a very comfortable experience for the angler. The back rest can be adjusted to however feels best to the individual and quick adjustments can be easily done while on the water. You can also strap the back down tightly for added security when hauling the kayak. I'm built like a giraffe, so I was a little nervous as to whether or not I'd be too tall to comfortable fish from a kayak. I can certainly say, however, that I have plenty of room in the Predator PDL. The seat is mounted on an adjustable track that can move back and forth, just like the seat in your vehicle. I'm able to comfortably stretch my legs which allows me to fish all day long. Now this is something that's really cool about this particular kayak. It features the PDL Drive system that allows you to instantly switch from forward to reverse. No switches or anything crazy. 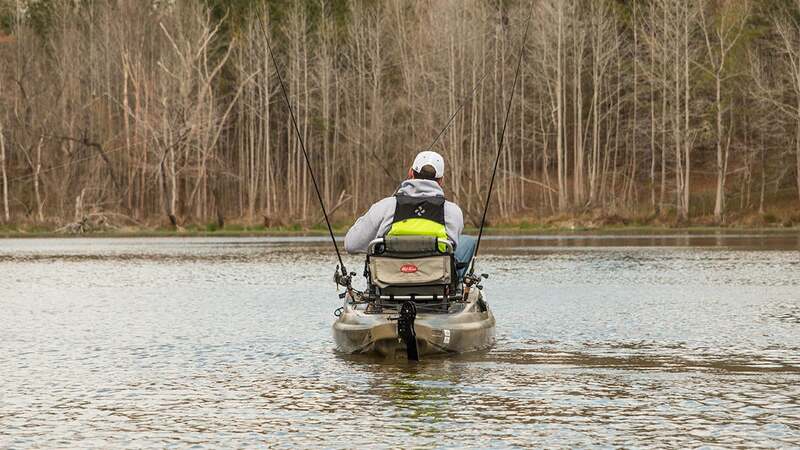 With this hands-free operation, you can focus on the fish; not maneuvering your kayak. 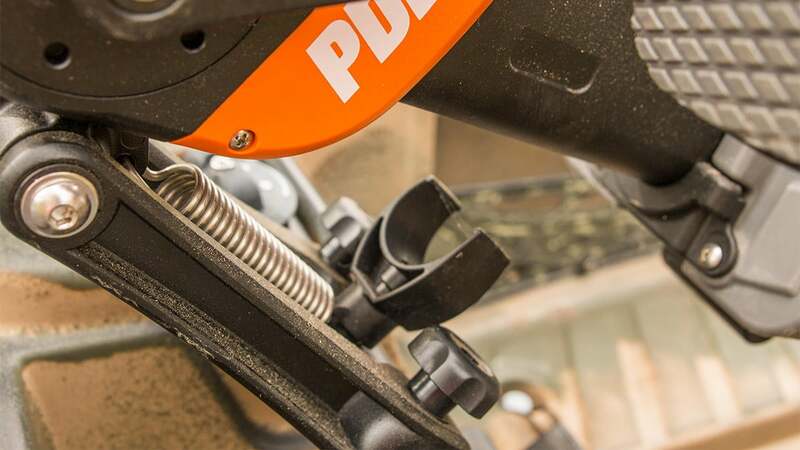 The PDL Drive is also easily removable and it takes just a few seconds to put on the kayak. There's a locking switch on each side that keeps it in place and that's it. It's very easy and anyone can do it. 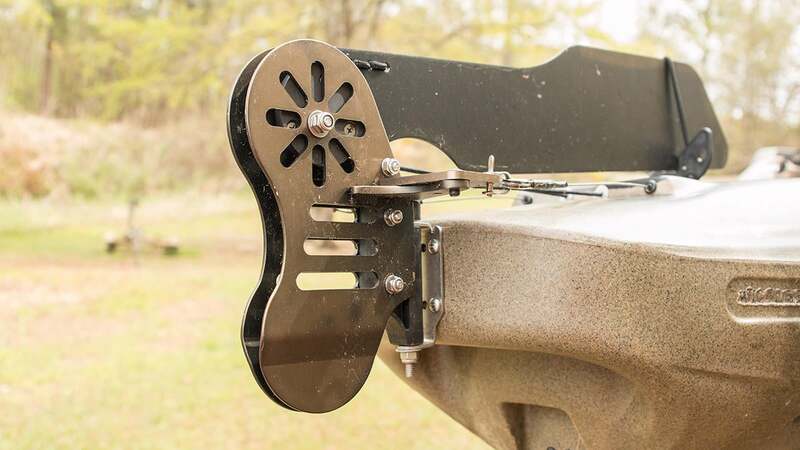 Whether you're just starting your fishing day or ending it, I've found that the PDL Drive is super simple to stow and deploy thanks to the spring-loaded mechanism on the underside. 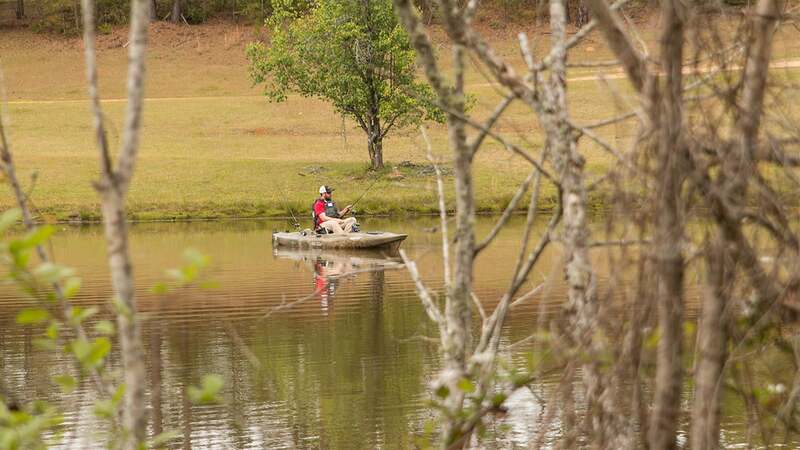 It's also quiet, so if you're fishing shallow you won't spook the bass when you first launch the kayak. In addition to being intuitive and easy to use, the PDL Drive also has a five-year warranty. 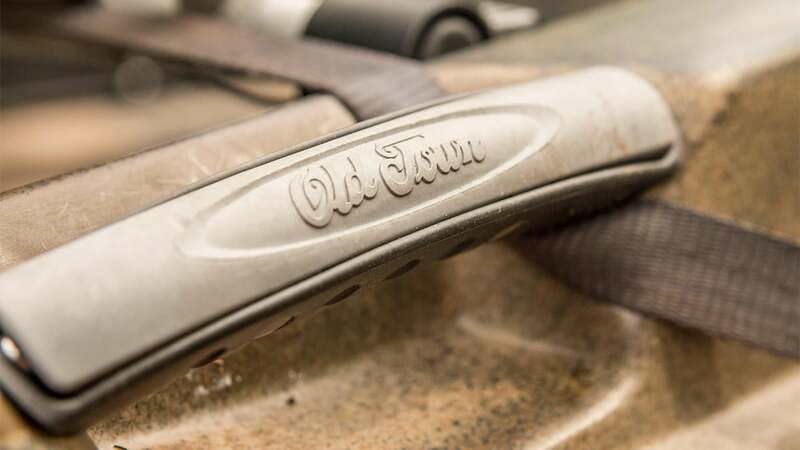 I haven't had any issues with mine whatsoever (it has been totally maintenance free), but it's nice to know that if something does happen to go wrong, the folks at Old Town will make it right. I've been in a few kayaks where the rudder seems really wobbly and unsteady, which makes it slow to respond to steering adjustments. This rudder, however, seems to be well-made and sturdy. I have hit it on all sorts of things over the past year and it still performs as it did the day I got it. Just pull up this handle and you can deploy and stow your rudder. I've put this prop through some pretty nasty situations this year and to be honest, I'm shocked it still looks this good. I've hit rock, wood and sandy bottoms and it has barely scratched it. The prop remains tightly fastened to the PDL Drive and it still functions like brand new, despite the abuse. If you're anything like me, you can't make yourself take just one rod fishing. 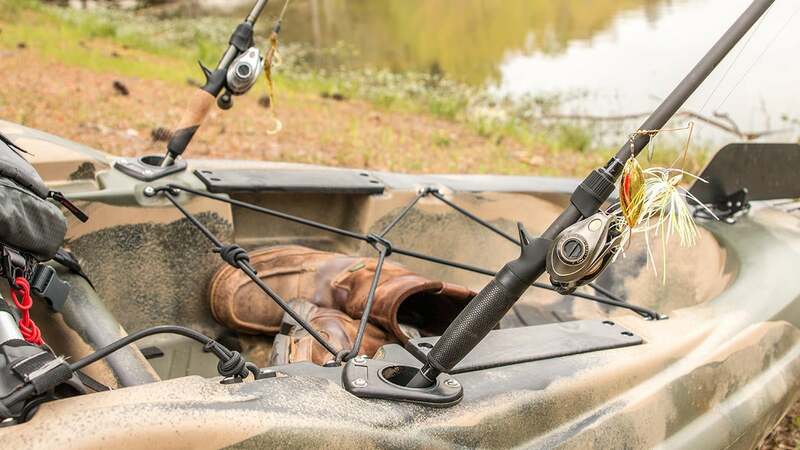 When I got into kayak fishing, I was worried that the perceived lack of rod storage would be my biggest obstacle. But this kayak has really exceeded my expectations in that regard. You can easily have three rods on board without any modifications, although additional mounting options are available. Personally speaking, I generally don't need any more than three, so I'm happy. The rod holders also hold your rods at an angle, towards the back of the kayak. This helps get them out of your way when casting and setting the hook. They're close enough to the seat, however, to allow you to quickly change rods without torquing your back. 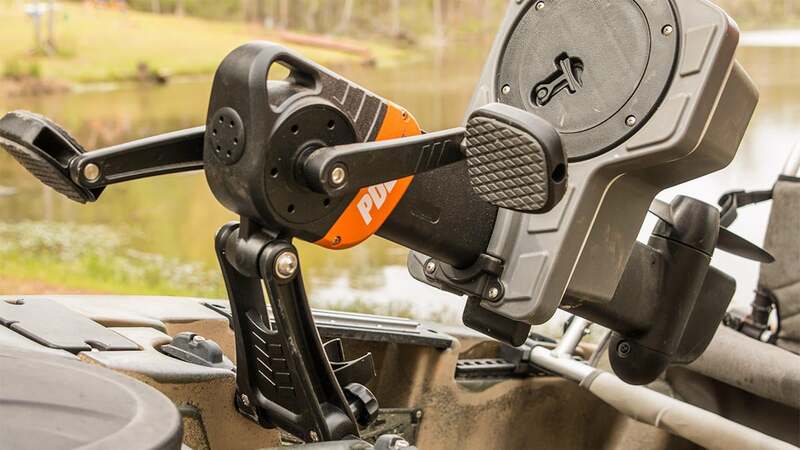 I've seen some rod holders that make me a little nervous; they seem too shallow and I can just imagine one of my expensive combos taking a plunge into the lake. Fortunately, the Predator PDL is designed with deeper rod holders that keep your investments secure at all times. 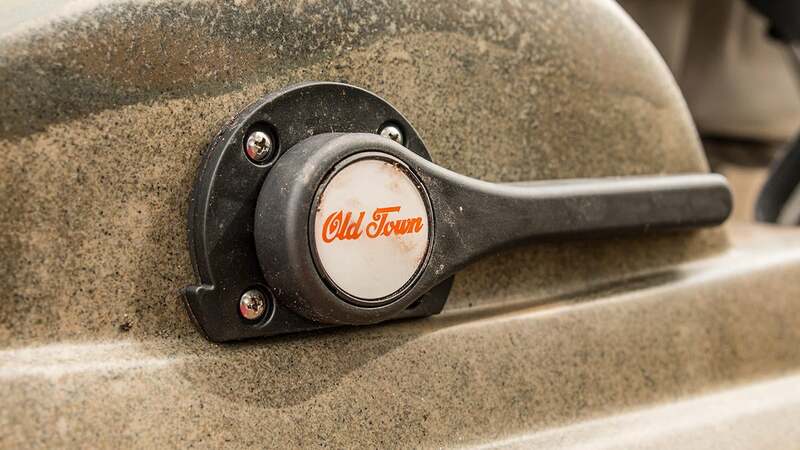 The large bow hatch with Old Town's Click Seal Cover is a convenient feature, especially if you like to take longer fishing trips. 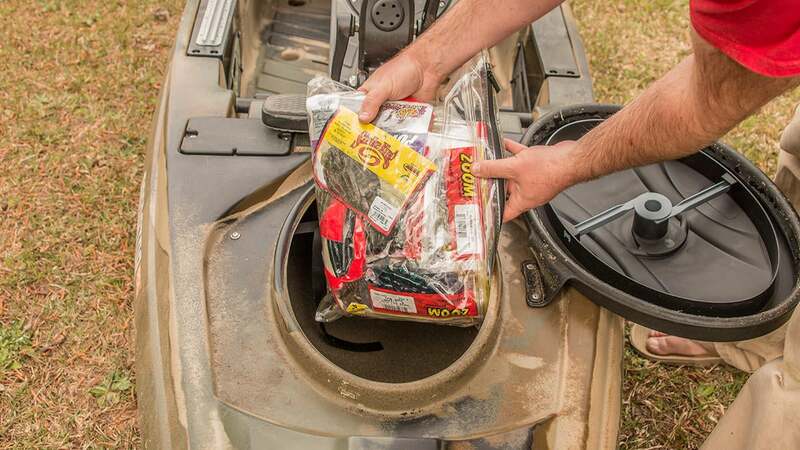 You can store rain gear, sunscreen, food or in my case, I'll keep my bulk soft plastics in there for quick access. This is a really big compartment, so you'll have no problems fitting all of your gear. Each side of the kayak has gear storage pockets that have proven to be incredibly convenient for me. 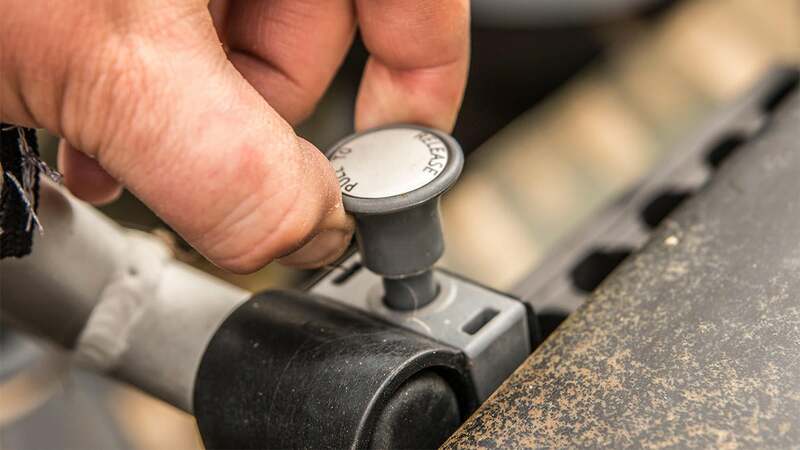 They're at a perfect arm's length from the seat, so if you need to quickly re-rig or switch colors, you're able to get it done quickly and efficiently. If I'm getting a lot of bites on a particular color or bait, I'll put them in these pockets. I'll use them to store my digital scale and pliers. The possibilities are endless with this storage area. On this particular day, I was storing my boots there because it was very muddy. But you can easily fit a cooler or oversized tackle box back there. 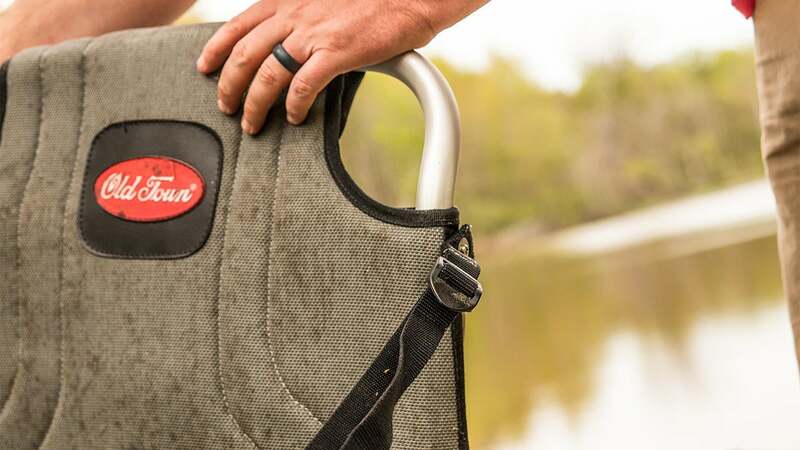 The convenient straps also help keep your gear safe and secure on the water. I can't get a regular boat in the area where this photo was taken. The Predator PDL helps me get in these ultra-skinny areas quietly without spooking fish and making my presence known. I can go just about anywhere and target fish that never see lures. 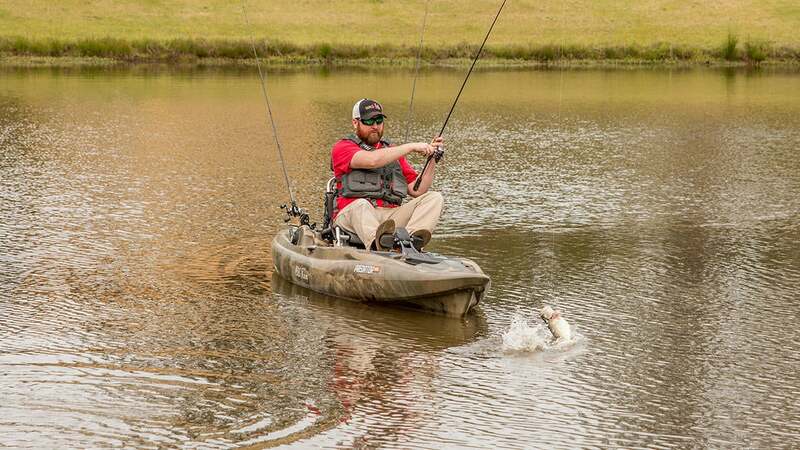 You'd think that it may be kind of tricky landing a bass in a kayak, but that hasn't been the case. 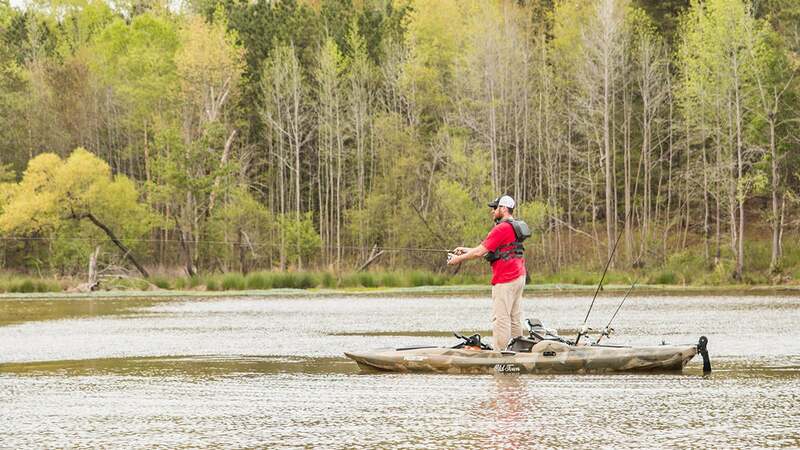 I can easily lean over and lip big bass without ever feeling like I'm going to tip over. This kayak is actually sturdier than most Jon boats I've fished from. If you look closely, I'm actually propelling my kayak backwards while fishing with both hands. 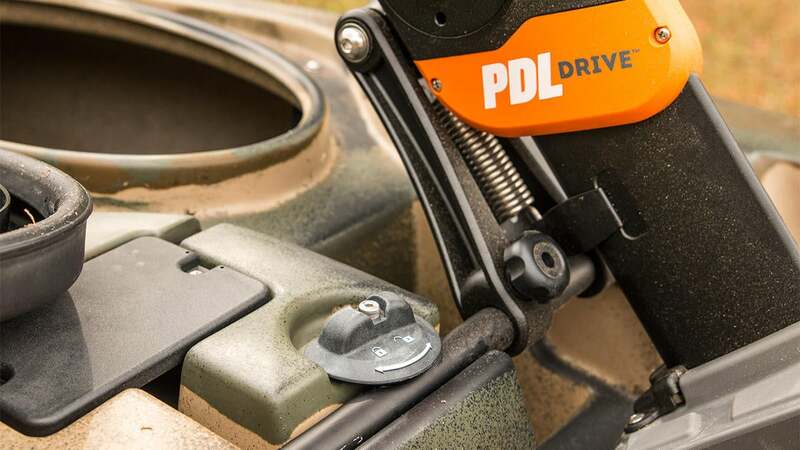 Whether a stiff gust of wind blows you too close to your target or you're fighting a strong fish, you'll certainly find the instant reverse capability of the PDL Drive a huge advantage. You'll be able to focus completely on fishing and nothing else. Anyone can use the Predator PDL with ease. When I first started, I was by no means an experienced kayak angler. It took me a trip or two to get the hang of things, but after that it became second nature. I'll admit that it took me a while to get the courage to try this. I am used to big bass boats, so I could just imagine myself doing a backflip and falling into the water. I'll be honest, though; standing up in this kayak is really not hard at all. In fact, I'd even say it's easy. I can cast and set the hook without any complications. 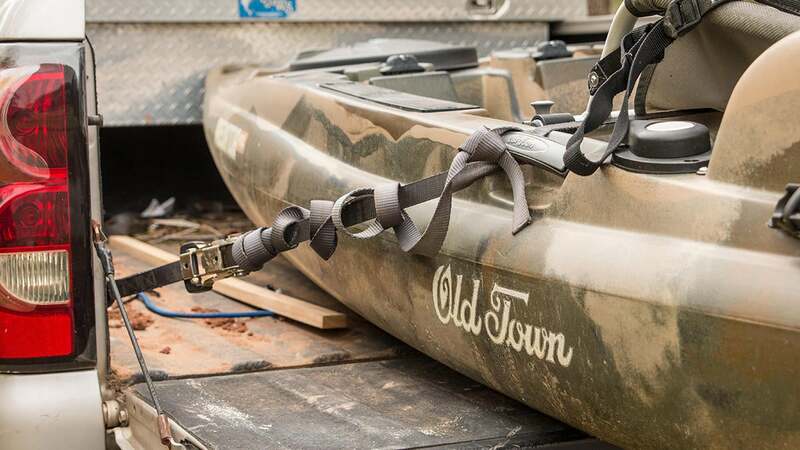 Sometimes it's necessary to stand up whether you're bed fishing or making complicated skip casts under overhanging cover, so I'm glad that Old Town makes such a sturdy kayak. If you look closely at this photo, you'll notice that there's no wake or ripples anywhere around my kayak. It was a flat-calm day and bass become rather wary in these conditions, so stealth is paramount. I can maneuver the Predator PDL quickly and quietly without disturbing the surrounding environment. There's something inherently exciting about watching a bass jump when you're so close to the water in a kayak. Even though this fish wasn't a giant, it's a totally different sensation than fishing from the bank or a bass boat. 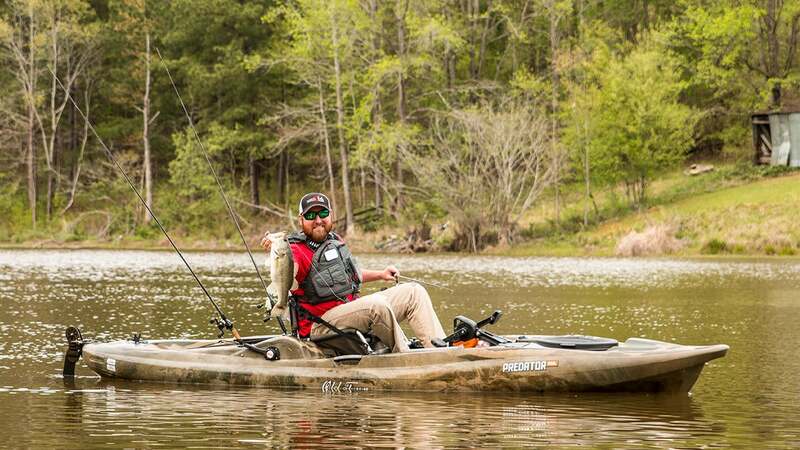 While I haven't tried all of the fishing kayaks on the market, I can safely say that the Old Town Predator PDL is a well built kayak that has allowed me some really special angling opportunities. 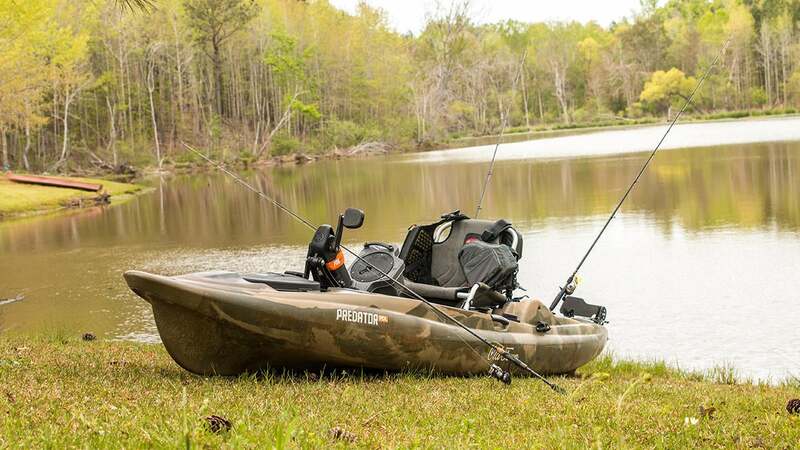 This model allows you to focus on fish without messing with maneuvering, anyone can use it, the PDL Drive is backed by a five-year warranty and all Old Towns are made in the USA. Pretty stout fact sheet, if you ask me. For full specs and purchasing information, click here.